Many foods produced on an industrial scale include raw ingredients mixed together in enormous stainless steel machines that can be difficult to clean. With repeated use, equipment surfaces get minute scratches and grooves, providing bacteria and biofilms the perfect place to hide. Surface-trapped food residue and bacteria then increase the risk of contamination from micro-organisms such as salmonella, Listeria and E. coli. But Ben Hatton, an assistant professor in U of T's department of materials science and engineering, and fellow researchers Dalal Asker and Tarek Awad believe they have an answer that's as simple as it is effective. 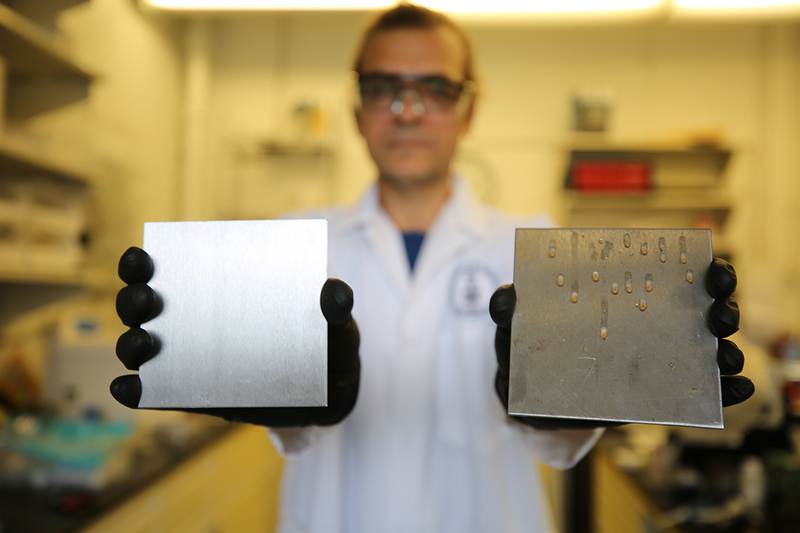 They propose trapping a thin layer of cooking oil at the metal surface to fill in microscopic scrapes, cracks and fissures, creating a barrier to bacterial attachment. “Coating a stainless steel surface with an everyday cooking oil has proven remarkably effective in repelling bacteria,” says Hatton who collaborated on the project with AGRI-NEO, an Ontario seed processing company looking for a solution to a common problem in the industry. The team, which researches cheaper, safer and more effective ways to prevent bacteria thriving inside these machines, found that this solution reduced bacterial levels inside the industrial equipment tested by one thousand times. Their work was recently published in the journal ACS Applied Materials & Interfaces. This simple and cost-effective alternative builds on the Slippery Liquid-Infused Porous Surfaces (SLIPS) principle, which was initially developed at Harvard University to trap lubricant layers into a surface micro-structure and create slippery, non-wetting and non-adhesive properties. Cooking oils such as olive, corn or canola also provide a safer option for cleaning food-processing equipment than the harsh chemicals and disinfectants that are typically used. The sheer size of the machines makes it harder for cleaning materials to do a thorough job, and leftover bacteria can build up resistance to the cleaning agents. Hatton’s method of filling the scratches with oil prevents bacteria from settling and essentially cleans the surface without leaving chemical residues on the stainless steel surface. The Hatton research group continues to test new combinations of oils, foods and biofilm types to increase the efficiency of the bacteria barriers. They will also explore the possilbility of using this method in developing countries to minimize bacterial infection and improve mortality rates. The research was supported by the Natural Sciences and Engineering Research Council of Canada (NSERC) and the Canada Foundation for Innovation.